We really liked this bull and are very proud of what he has done for our herd. He had the thickness, length, and quarter that is hard to find all in one package. Disposition is very important to us and he definitely filled that with his easy going -scratch me attitude. 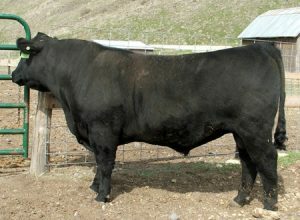 His calves are easy fleshing and very eye appealing with a lot of growth, they are born in the 78-85 pound birth range. 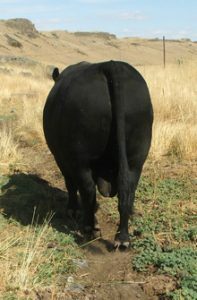 He produced some GREAT calves and thankfully we still have straws on him, so his genetics are still going strong for us. While we continue to branch out into new genetic lines we are thankful that we used “Biscuit” as our foundation. To see EPDs and pedigree click here, then click the [SEARCH] button. We have been very happy with the calves this bull has produced, and he has done a good job of filling the calving ease status with our heifers. We really like his heifers and will be keeping replacements to put back in the herd this year.